In the late 60s, Mercedes had a series of unique drivetrains and other technological advancements it was looking to develop. 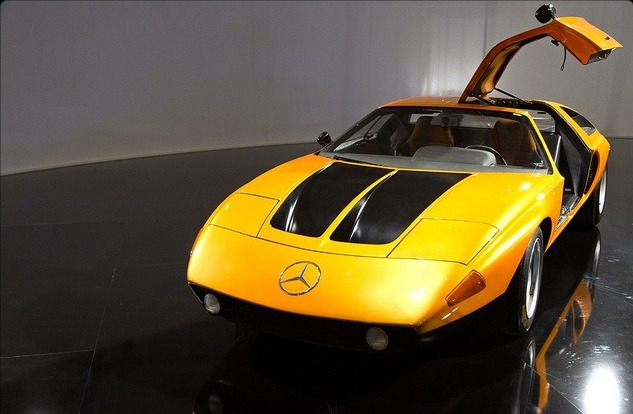 In 1969, Mercedes developed the C111 as the platform to house and test these innovations. The first version hosted a Mercedes-designed three rotor direct injected Wankel engine. They placed an aerodynamic fiberglass body shell over the platform, with the engine rear-mid mounted. The first cars were painted orange metallic, specifically to attract attention. The following year in 1970, the second iteration of the C111 appeared, this time equipped with a four-rotor Wankel producing 370 hp. The car was capable of speeds of 185+ mph, and was recorded with a 0 to 60 time of under 4.8 seconds. Seriously quick even by today's standards, let alone for nearly 45 years ago.